We helped host brunch for the fourth year in a row. 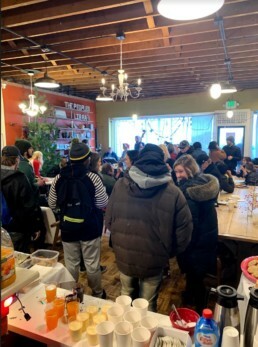 For the fourth year in a row, Burners Without Borders Seattle helped the Aurora Commons host their annual Christmas Brunch. Our seven volunteers helped cook and serve 18 pounds of bacon, and they kept the beverage station stocked with coffee, tea, hot chocolate, eggnog, and juice. Financial support from BWBS allowed us to give care packages to all of the 100+ people who came to celebrate and eat bunch with us.